Last year, I shared with ya’ll how I’m not really into doing great big birthday parties. I wasn’t hugely enthusiastic about it this year, either, to be totally honest, but Jade’s been looking forward to her birthday ever since Halia’s in November. (Hmmm, that happened last year, too, didn’t it?) 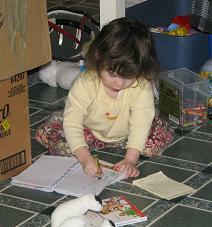 Plus, this year, Jade’s excitement level has been heightened by all the birthday parties from her preschool crowd. There have been three birthday parties since the beginning of December, and the whole preschool has been invited to each of them. I’ll admit they’ve been fun, and it’s a nice chance to get to know some of the other parents. Jade had so much fun at the Polarettes Gymnastics gym at the December birthday party that we decided to have her party there, too. All the kids can just run around and enjoy the equipment and the focus doesn’t have to be on food. I figured I’d buy a bunch of helium balloons, bring a few trays of food, put together some fairly simple loot bags, and call it good. But! At the last birthday party we attended, we discovered that we had booked the gym for an afternoon the day after Diego was going to have his birthday party there. Argh. In half a minute, we decided to just go ahead and combine the two parties into one. Hurrah! Shared costs, guests who aren’t wondering why they’re going to the same place twice in one weekend, plus cutting down on the volume of gifts because we’re asking boys to bring presents for Diego and girls to bring one for Jade. Diego’s mom has a couple of older children and so has been doing this birthday party stuff for years. Plus she is one of those really energetic creative people full of awesome ideas and who owns a crazy art printer and more scrapbooking supplies than you can shake a stick at. 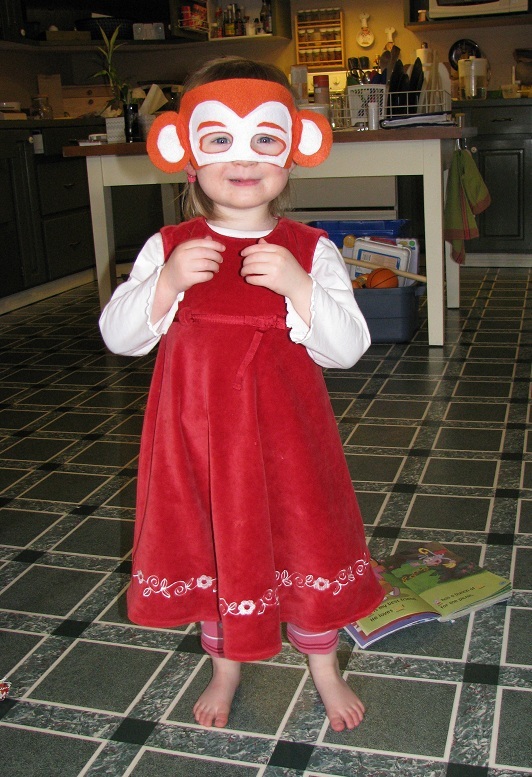 She came up with this great “Let’s Monkey Around” theme using an adorable image of two sock monkeys hugging. Her “draft” invitation was so cute I nearly died. Once we started brainstorming ideas for the loot bag (bananas with monkey-themed banana stickers on them, water bottles with custom labels, magnets, stickers, an activity book, crayons with sock-monkey labels) I decided it would be fun(!) and easy(!) to make monkey masks. Here’s the thing. Every party so far has included the parents (because so many have special needs, and they’re really not at the age yet where you just drop the kid off and go) and of course that means the siblings are there, too. Halia has been given a share in the loot bag loot at every party… So since this is a double party (each family will have some extra people there), I figured we should prepare about 30 loot bags. 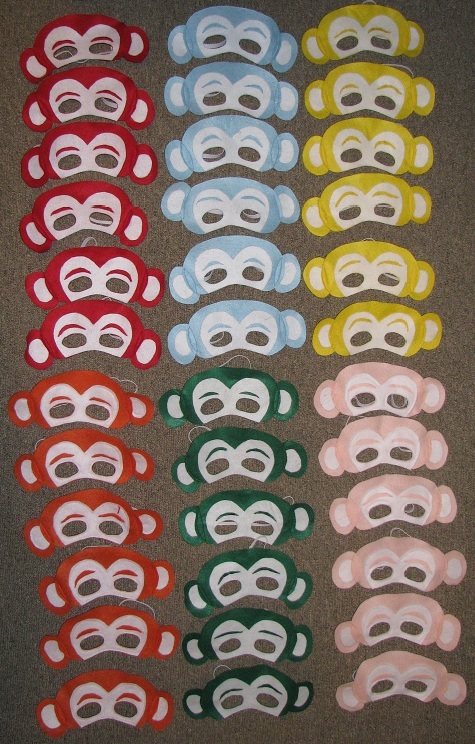 In case math isn’t your strong suit, that there is 36 monkey masks. These really are incredibly easy to make and they don’t take long, either. But, you know what? I am looking forward to the party. And I think the monkeys are, too. These past two weeks have pretty much chewed me up and spit me out. The proof is that I finally went to the doctor to get a note about going on stress leave. But I really don’t want to turn this blog into the All Epilepsy All the Time Channel, so today I’m going to talk about my birthday present. The truth is, my birthday isn’t happening for a month yet, but I, um, went and bought myself my present yesterday. It all started a couple of weeks ago when I decided to sew a body pillow for myself. Michael has complained about the many pillows taking over the bed and I thought maybe a body pillow would make a good substitute for a few of them. One pillow instead of three! The body pillows I found in our local stores weren’t long enough, though, so I bought a body pillow case instead and I stuffed it with some leftover pillow stuffing that I’ve had sitting around for, oh, five years or so. To stitch it shut, I hauled out my very old sewing machine, a lead-bottomed beast that once belonged to my mother. It’s so old that the plastic body is crumbling. I’ve often thought that I would sew a little more often if the beast weren’t so awkward to haul out and if it weren’t so temperamental. How temperamental? On the evening in question I plugged in the machine and started stitching. Every time I pushed down on the foot pedal, a little puff of smoke would emanate from the motor. (This is actually not new, but it does make me rather nervous.) Every few inches, the light would go off and the machine would stop working — no power was getting to the machine, but I couldn’t tell why. I’d advance the needle manually by turning the handwheel (still faster than stitching by hand, anyway), and then after a minute or two the light would come back on and I could use the foot pedal again, generating yet another little puff of smoke. In the end, it took about ten minutes to stitch up a foot of fabric, a job that would’ve taken less than a minute with a non-delinquent sewing machine. Also, instead of a nice neat line down the end of a pillow, it wobbles and doubles back on itself; a drunken sailor could have done a better job of it in the middle of a storm. The whole experience left me so paranoid that I decided then and there that this sewing machine had absolutely had it. In fact, when the power went out 10 minutes later, I thought maybe I’d tripped a breaker somehow, even though I wasn’t even using the thing anymore. (The power was out in the whole neighbourhood, though, and even at 12:30 at night and sleep-deprived I’m not paranoid enough to think I can shut down an entire neighbourhood with a faulty sewing machine.) I told Michael the next morning that I wanted a sewing machine for my birthday. Yesterday I went out with Jade to find a few things for her new room, including blinds for the window. I couldn’t find anything the right size and decided that blackout curtains would work better, but they require a bit of alteration. Which requires a working sewing machine. Since I was at Wal-Mart, it was simple to pick one up while I was there. Jade was too restless to stay in the shopping cart, so she wandered around the fabric section while I tried to read the features of the different machines while keeping an eye on her. (She’s having so many seizures these days that I don’t dare let her out of my sight for more than a few seconds.) I decided on a machine fairly quickly, hauled it into the overflowing cart, and hurried home to feed Jade some lunch. The machine isn’t actually out of its box yet, but I have read the instruction manual, and I am revelling in the sleekness and non-crumbliness of it. The only thing I regret is that when I picked Michael up from the airport yesterday (he was in Yellowknife all week) and told him about my birthday present, he said, “Oh… what did you get?” He sounded a slightly amused and slightly put out when I told him. Apparently, he’d already spent some time researching sewing machines in anticipation of buying me one for my birthday. But isn’t it wonderful to know that he was really paying attention? Categories It IS all about me! Michael celebrates his birthday today. Well, we celebrate his birthday today and he kind of endures it. Or something like that. I always love to have a big party on my birthday, just because I like parties. But Michael likes to have things quiet, to be at home, eating some good food. This year he told me I didn’t have to make him anything special if I didn’t want to, which, of course, is one sure way to get me to do it. Nothing is more compelling than someone being completely undemanding. In years past, he as always requested a fruit pizza rather than a cake, so that was the first thing I decided to arrange. It’s not hard to make, it’s just a bit fiddly, and since his birthday falls inconsiderately in the middle of the workweek, I had to get it done yesterday. Isn’t it lovely? Please, help yourselves to a virtual slice. Michael won’t share the real one (one of the reasons he doesn’t want a party? ), but there’s lots to go around on the blog. Tim asked me yesterday morning if we were doing anything for Michael’s birthday. I mentioned the fruit pizza, but then remembered that Tim doesn’t like it (he doesn’t go for the cream cheese filling) and so I thought, well, I ought to make shepherd’s pie, too. I think that’s what Tim always asked for on his birthday and it’s also one of Michael’s favourites. But it takes quite a bit of time to put together. So I made that yesterday, too. Then I decided we needed to have more than pickled beets (an absolute must-have accompaniment to shepherd’s pie in the Pealow household) to represent vegetables so I went ahead and made Caesar salad dressing, too. I’d probably spend the same kind of time in the kitchen for my own birthday, but I haven’t had a real birthday party since before Jade was born. The year before she turned one it was just more work than I could handle, and this past one we were travelling home from Mexico on the day of my birthday. Now I’ve got baby #2 due pretty much on my birthday, so I guess I’ll have to either forfeit another party this year, or else decide to celebrate really early in November. I think I just may have to do that, because it will be the big 3-0 for me, and how could I let that one pass without a big hullaballoo? But, anyway, that’s a whole six months away, so I’m getting a bit ahead of myself. For today, I’ll just stay focussed on the person in the family whose birthday it is. Happy birthday, Michael! You are turning 2 today and I feel so far away from you. You’re spending the day at a friend’s house and I’m taking a change management course (is that irony?) But that’s actually pretty good compared to last year, when we spent your first birthday at the doctor’s office getting you diagnosed with an ear infection. The day got off to an exciting start. We found that the continuing -40 weather had frozen our car up and since Papa is facilitating a workshop today and I couldn’t miss my course, we were scrambling to organize transportation. Thank goodness your friends Bella and Louis were happy to have you visit them for the day, because getting you over to daycare just wasn’t happening! Don’t worry, we’ll do something to celebrate tonight. Papa baked you two cakes: one to take to daycare (and since you’re not there, you’ll get an even bigger piece!) and one to have at home with your family. There’ll be presents, although I hardly know what you’re going to do with more toys. The main thing is, we’ll all be together as a family, celebrating you, celebrating getting to know you these past two years. 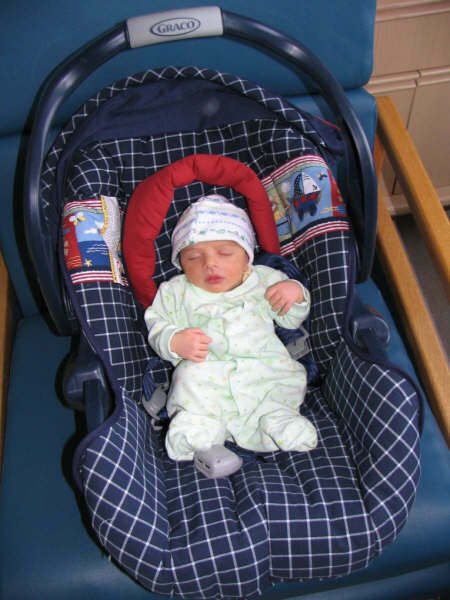 This is a picture of you when you were 2 days old – look how tiny you were! Now you’re big enough to look at that picture and say, “Baby!” You’re big enough to rock your dolls and ask me to sing lullabies to them. Big enough to put your clothes away in your drawers (where they were previously nicely folded), to put on my shoes by yourself, and to give me a hug without my even asking for one. You’re big enough to have regular meals and snacks where you feed yourself instead of spending an hour out of every three attached to your personal milk-machine. In other words, you’re big enough to be just a little independent from me on your birthday, celebrating with your friends. But I can’t wait to pick you up this afternoon so that I can give you an extra-big birthday hug. And then we’ll get right down to that cake Papa made you!